Multi-billion-dollar developer FivePoint is desperately trying to hold on to their control at City Hall, with the help of shadow committees they fund with “dark money” to elect their pro-developer candidates. 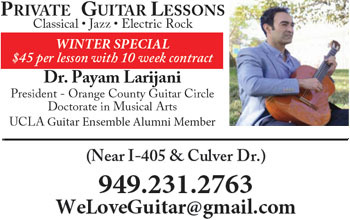 In just the past two years, FivePoint has spent over $3 million on local elections in support of Irvine Mayor Wagner. In this election, one of FivePoint’s shadow committees (Alliance for Jobs and the Economy) has purchased street signs, TV ads, Facebook videos and campaign mailers, claiming Mayor Wagner and his team (Irvine Planning Commissioner Anthony Kuo and Irvine Transportation Commissioner Carrie O’Malley), are “blocking development” and “fixing traffic.” Nothing could be further from the truth! In fact, the number of new building permits in Irvine has doubled, and, obviously, traffic in Irvine has gotten much worse since Wagner became Mayor. 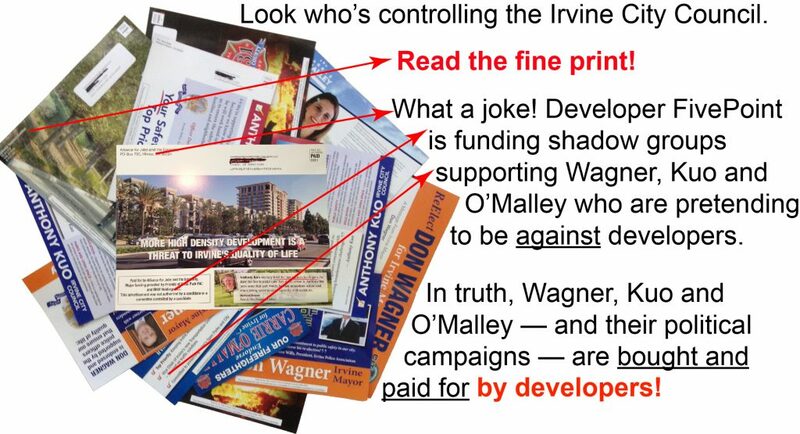 Irvine Community News & Views has now learned that one of FivePoint’s shadow committees funding Wagner, Kuo and O’Malley is also behind the outrageous attack ads launched against three Council candidates who have a history of standing up to developer FivePoint. 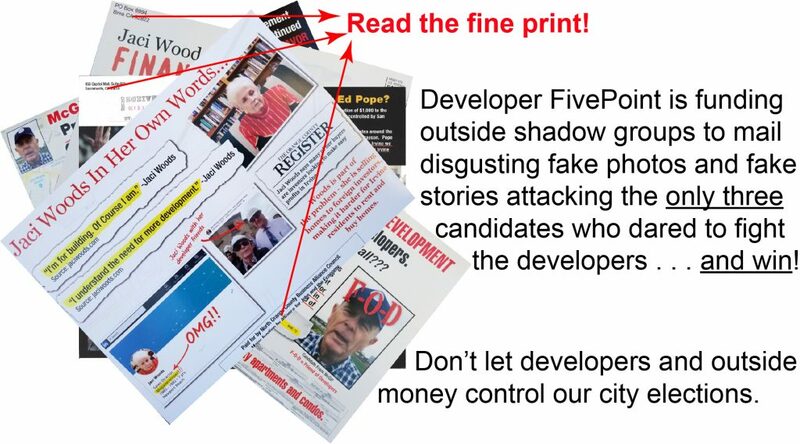 The FivePoint-funded slick mailers attack the only three candidates (Ed Pope running for Mayor of Irvine and Jaci Woods and Frank McGill running for Council) who had the courage to stand up to Mayor Wagner and developer FivePoint. Pope, Woods and McGill led the grassroots campaign to stop Measure B last June. Their efforts successfully stopped FivePoint from replacing our long-planned Veterans Cemetery in the Great Park with 812,000 square feet of development, which would have brought 10,000 more cars and trucks to Irvine streets every day. These disgusting developer-funded attack mailers are filled with fake photos, fake stories and outright lies. As publisher of Irvine Community News & Views, I feel it is my duty to sound the alarm about what’s going on here: FivePoint thinks they can get away with flooding Irvine mailboxes with lies and smears directed at the only candidates who had the courage to stand up to them. Apparently, developer FivePoint will say anything (and attack anyone) to keep control of City Hall. On November 6th, Irvine voters can put an end to the kind of sleazy politics that developer FivePoint has brought to Irvine. Your vote is your voice. 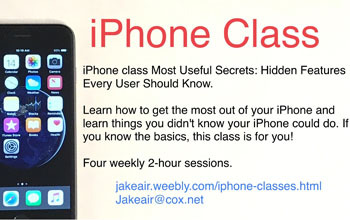 I urge you to use it!